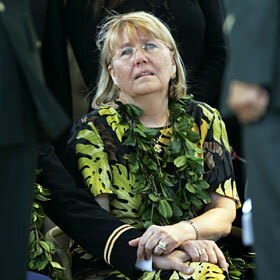 LAID TO REST » Lis Olsen held the hand of her husband, Army Col. James Olsen, yesterday as the American flag that was draped over the casket of their son, Toby, was folded. The flag was then presented to the parents at the end of yesterday's service at Punchbowl. Toby Olsen's father said he saw "great sadness in his eyes" prior to his death in Iraq. A sailor, 22, and a Marine, 34, are killed in Al Anbar province. Oceanic scrambles to deliver converters likely to sell out today. Critics say the story wrongly portrays Japanese as war victims of Korea. A retiring bishop hopes a Buddhist high school can rejuvenate an aging sect. If the opinions of Tiki Barber and Will Shields are indicators, NFL players prefer that the Pro Bowl remain in Hawaii. The Hawaii first baseman collects three extra-base hits to give UH a win over Georgia Southern. Hawaii has not beaten the Wolf Pack in nine visits to Reno. Talk of the cuts had circulated for a week at the two former St. Francis medical centers. A veteran killed himself after telling the Veterans Administration he was considering suicide and being put on a waiting list.